Discussion in '114 type 1600, 2002, 2002ti/tii (1967-1976)' started by BlueAngel M3, Jul 2, 2009. I'm thinking about switching to BMW synthetic 5/30 oil. Its a 1975 2002 carb motor. Your thoughts please. Thanks in advance. I think it is okay to switch to synthetic, but do not go to 5/30, these motors were not designed for this thin of an oil. Stick with either 10w-40 or 15w-40. Also I would suggest committing to a particular brand and then staying with it. You run into problems when you keep switching. You might see a little engine oil use when switching because the synthetic can get past the old seals. I have an 84 318i (M10 Motor). When I bought it with 66k on it I switched over to all Red Line synthetics including the motor. It uses almost no oil between oil changes. The car now has 76K on it. I say don't bother with synthetic in the 2002. Stick with dino-based 20W50. I've been happy with Valvoline and Castrol during my 29 years of '02ing. My plan was to find a thick synthetic oil and sticking to it. I figure the engine will last longer. I run Castrol Syntec 5w-50 in my 02. It's what Dinan recommended for it and also what the guy I bought it from put in regularly. Works fine. How many miles have u put on the engine since you switched to synthetic? Of all the cost-benefit analysis I've heard, probably the most significant one is that synthetic may leak from an older engine where non-synthetic doesn't, necessitating disassembly to replace gaskets and seals. The M10 in the 2002 is nearly bulletproof, at least as far as oil-related failures are concerned. You are better served to use the same oil it has been using and pay more attention to the cooling system. I would agree with CR, I changed to synthetic on one oil change and ended up with spots on the driveway where I never had any before. I switched back to dino oil and have no leaks whatsoever. As long as you change the oil on a regular basis, the 02 motor will last almost forever. I'm on my 4th '02 now and the bodies have disintegrated long before the motors ever showed any signs of giving up! How often you change your oil in these cars? Every 3k miles? Would the old BMW 5/30 non-synthetic oil work for these engines fine?? We're now back to where we were nearly 3 months ago. I don't know where your 2002 lives, but non-synthetic 20W50 works for most parts of the USA. If you're driving it in the far-north 10W40 will work. 3K-5 between oil changes is fine. You can send your oil off to be analyzed to know for certain how the lubrication and additive packages are holding up. Have you consulted the owner's manual, usually found in the glove box? 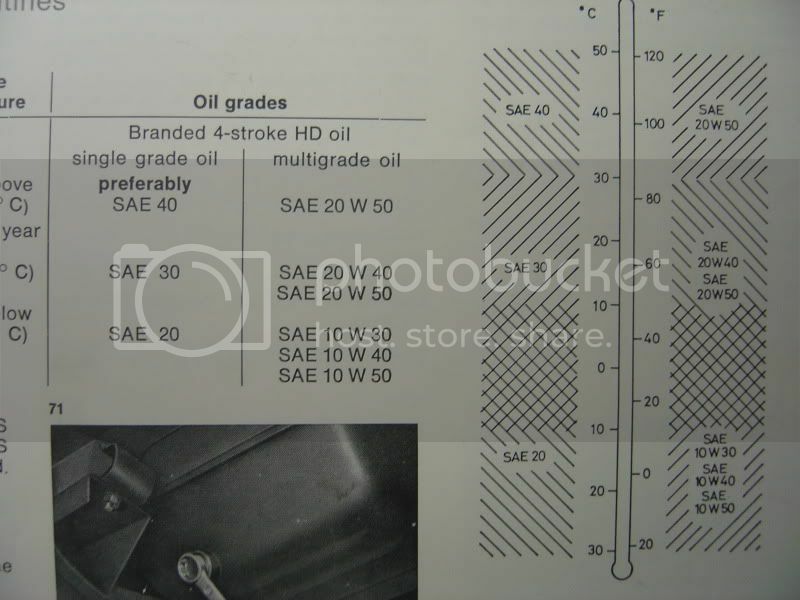 There is a chart showing you what oil grades are suitable for what temperatures. i'm in NY. What do u recommend for summers and winters or all year round? Owner I bought it from put synthetic in it too. If I disregard his mileage with the car I alone have put close to 10k on it using synthetics. I read in Grassroots Motorsports (genius magazine for those who don't know it) that it is generally better to switch to a synthetic even in an older car, and that people usually go overboard with getting insanely heavy oils and can easily get away with a lighter weight. I wouldn't be passing on this information unless I was 100% sure the guys that write that stuff know what they're talking about (they even talked to the owner of Red Line Oil). My car has been run of 5w-50 though for as long as I know and I'm just gonna stick with it to not have the hassle of testing different weights and such. I would not run 5W oil in a 2002 under any circumstances! The engine design dates from 1962. It was designed to run on oils no lighter than 10W. Running a thinner oil is just asking for trouble. Then again, M10 engines are cheap and plentiful. Rebuild as many as you want. Synthetic oil in a 2002 is the answer to a question nobody asked. You asked if it was "wise" to change to synthetic in a '75 2002. No, it is not. It will probably never make a noticeable difference. However, if there is a noticeable difference, it is more likely to be bad (leaks, too thin to lubricate) than good. These cars originally came with what weight of oil? Anyone? 30 years ago, when I got my first 2002, we learned the care and feeding of our cars via the owner's manual, BMW, Haynes, Chilton or Clymer repair manuals and the car club members who had more experience with the models. Some things change, but we still rely on other owners for information. I don't know what web browser you are using, but mine has a search window at the top right corner, with anything I want to know about mere seconds away from my eyeballs! If you own a 2002 you owe it to yourself to check out http://www.bmw2002faq.com/. You can review the FAQs and search on topics of interest to you (use the Google option). 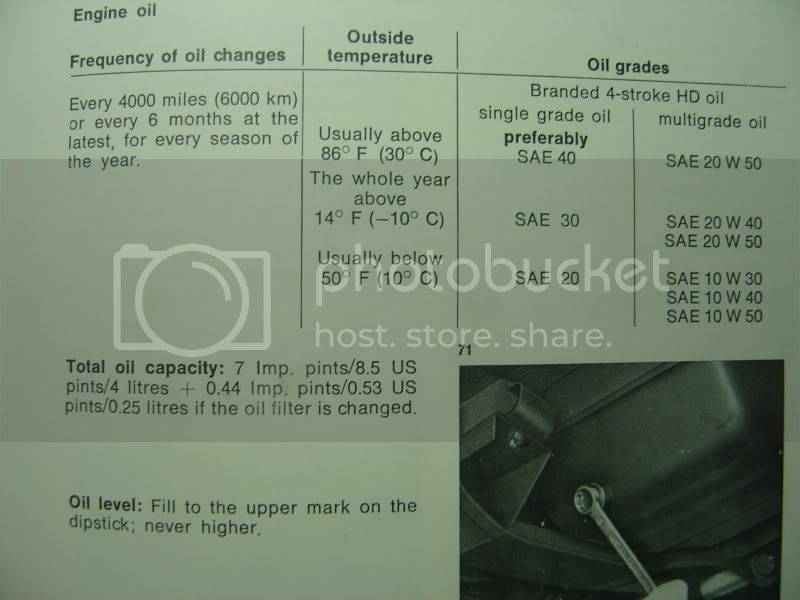 Without further ado, here are pictures of the oil change page from the BMW 2002 owner's manual. It wasn't written by Steve Dinan, Grassroots Motorsports or the owner of Redline Oils, so take it with a grain of salt. You can find owner's manuals for sale on eBay or through the "parts for sale" or "parts wanted" areas at bmw2002faq. 30 years ago, when I got my first 2002, we learned the care and feeding of our cars via the owner's manual, BMW, Haynes, Chilton or Clymer repair manuals and the car club members who had more experience with the models. Some things change, but we still rely on other owners for information. * I bumped you, John. CR, I do believe you & appreciatte your kind input.